Come to the Winters Community Library tonight, July 14, at 6 pm for a program for the grown-ups. “CHANGE YOUR LIFE – LISTEN TO MUSIC” is being presented by Lis Testa, Professor of Music at Woodland Community College. 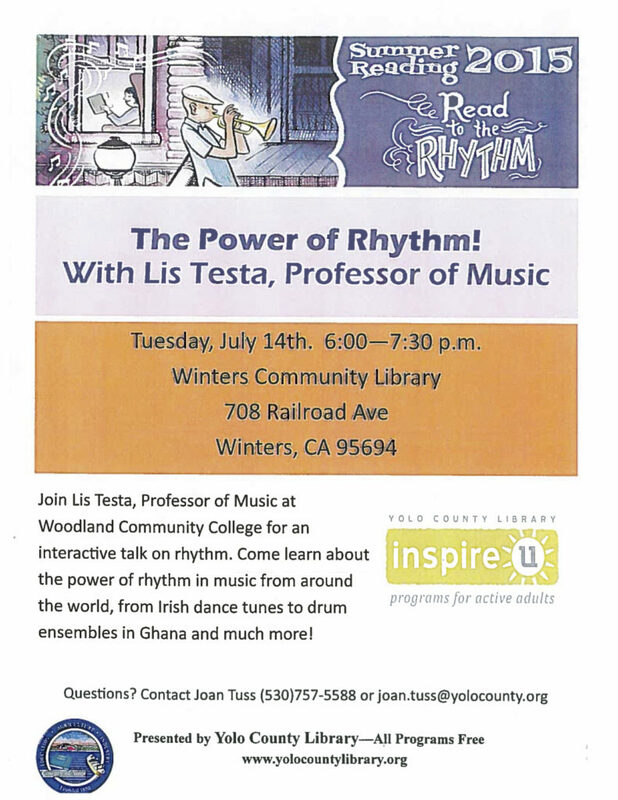 Join Lis Testa, Professor of Music at Woodland Community College and learn how music makes a difference in your life. Did you know that music can reduce muscle tension, improve self-image and increase self-esteem? Come learn about the power of rhythm in music from around the world, from Irish dance tunes to drum ensembles in Ghana and much more. The Winters Community Library is located at 708 Railroad Avenue in Winters, CA. Summer Reading Programs are not just for kids!